Our DoubleTree by Hilton Hotel Charlotte hotel offers a variety of meeting spaces to fit your business needs. We offer A/V equipment, first-class catering options and dedicated personnel to ensure your event is a success. Select from two package options, including a Day Meeting Package and a Complete Meeting Package. Each includes a dedicated meeting space, breakfast, lunch and A/V equipment. 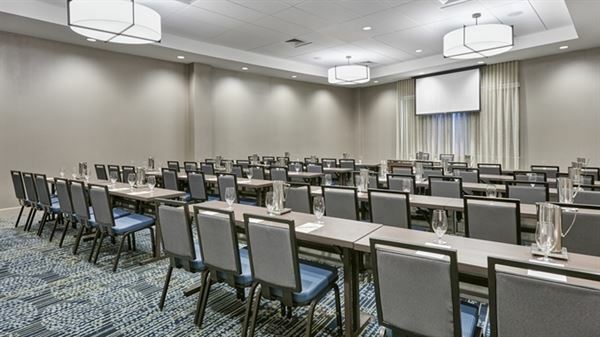 Providence Meeting Room, located on the first floor of the DoubleTree by Hilton Charlotte, features inviting warm tones of greens, blues and grays. This 1073 sq ft space has 540 sq ft of dedicated pre-function space, perfect for breaks and meals, or pre-receptions. This event space, opened in September 2015, has a large window to allow natural light in and can seat up to 100 people. We have on-site Audio/Visual capabilities including an in-room LCD projector and screen as well as personal lighting controls. Atmosphere/Decor: The Providence Room is a very flexible space...great for meetings, parties, reunions, or receptions. The designs are modern with classic blue and grey tones. Special Features: The Providence Room features a large built in screen (9.5 x 5.5) that lowers from the ceiling, in addition to the 4700 Lumens projector. It also has a large window, allowing for the option to have natural light fill the room.